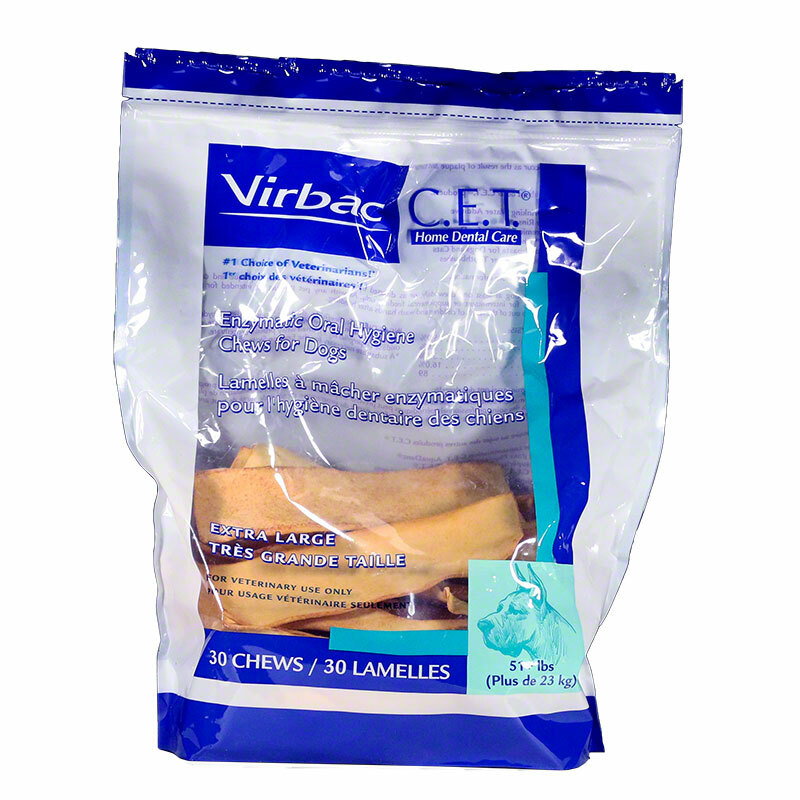 Case of 5 bags CET Enzymatic Oral Hygiene Chews for Dogs Extra Large 30ct. Pets have teeth too! Home dental care is as important for your pet as it is for you. A program of oral hygiene and regular professional care can prevent problems that might occur as the result of plaque and tartar buildup. Routine home dental care should be a part of every pet's health care program. The C.E.T. Enzymatic Oral Hygiene Chews for Dogs was designed with an exlcusive Dual-Enzyme System plus an abrasive texture. These chews help reduce plaque and tartar keeping theeth clean and breath fresh even on days when brushing isn't possible. Home dental care is important for your pet as it is for you. A program of oral hygine and regular professional care can prevent problems that might occure as the result of plaque and tartar buildup. Routine home dental care should be part of every pet's healthcare program. Dogs natural chewing action makes it work. Contains 5 packs of 30 C.E.T. Enzymatic Oral Hygiene Chews for Dogs - X-Large. Directions: Give your dog at least one chew daily, or as directed by your veterinarian, to reduce plaque and calculus. This product is intended for intermittent or supplemental feeding only. As with any pet product not intended for human consumption, please keep out of the reach of children and wash hands after handling. Ingredients: Beefhide, Dextrose (a substrate necessary for the Enzyme System), Poultry Digest, Hydrolysed Vegetable Protein, Primary Dried Yeast, Potassium Sorbate, Glucose Oxidase (Aspergillus niger), and Dried Whey Proein Concentrate.